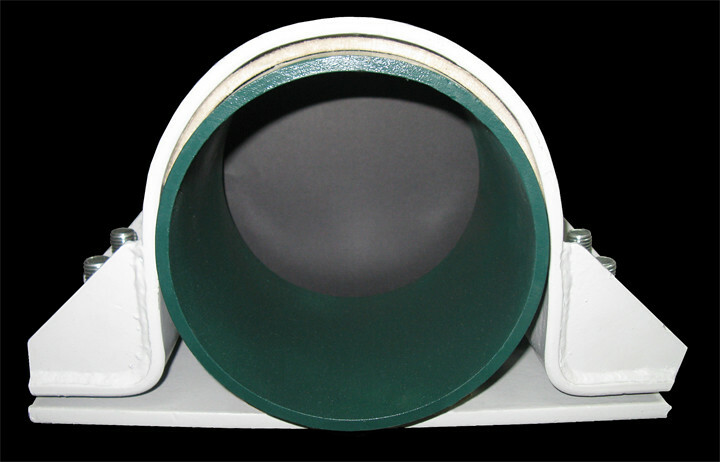 Arrestor Type Hold Down | Piping Technology & Products, Inc. The above photo shows an arrestor type hold down. This type of restraint is used when there is very low thermal movement. Its radius is lined with a belting material designed to absorb shock from movement. It is widely used on compressor lines or similar applications. The restraint type hold down’s clamp radius and base is lined with PT&P’s PTFE slide plate which allows for axial movement while restraining lateral movement and used on compressor lines where temperatures are high and thermal movement is great. This anchor type hold down is utilized on pipelines and require little or no insulation. It is fabricated from carbon steel and can be used in temperatures up to 750oF. Would you like to learn more about hold down clamps and slide plates? Visit our website archives today!